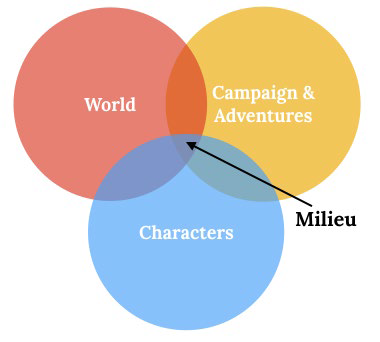 →What The Heck Is A Milieu? What The Heck Is A Milieu? What the heck is a milieu? I’ve been tossing out that term more often in recent Musings. And it’s how I think the game for two campaigns in development. But what’s it really mean? And how does it affect my GMing? Milieu is French for environment. The people, physical conditions, social conditions, and events in which someone lives. It’s the region that holds your plot. 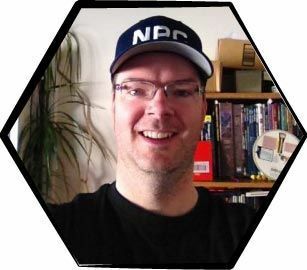 GM => World => Campaign => Adventure => Current Encounter => Characters => Players. Relevant details, concerns, and choices cascade down to where gameplay intersects right now. And it serves as both guide and strategy for my GMing. As a guide, it tells me what’s most important for each piece of world, campaign, and characters. This helps me prep smarter. I can focus on what’s most relevant to my Loopy Plans and the next five hours of gaming. What aspects of the world will come to bear for encounter X? And why will that matter to the characters? Why will it matter to the campaign? My strategy is to hone the pieces caught in the intersection. What lies outside has less priority. A flow and direction are also implied. The material outside the intersection can flow from the larger regions into the Milieu when relevant. So instead, I think of them as dials. I spin each dial so the relevant details I need for the current encounter are brought into the spotlight. The gameplay dictates which parts of the outside world, campaign, and characters get pulled into the Milieu. In this way, your Milieu gains ever more detail and nuance. It grows with gameplay. And that means depth. While still remaining relevant. What are the best parts of the game we can bring in right now for an amazing encounter?